Pianist Elena Matteucci graduated with special honors in piano from the Santa Cecilia Conservatory with Fausto Di Cesare, and in chamber music from the Academy of Santa Cecilia with Riccardo Brengola. She studied with Vincenzo Vitale in Naples. From the Chigiana Academy in Siena she was awarded an honorary degree and the prestigious Peterlongo Prize. Ms. Matteucci is a member of the Michelangelo Quartet, winner of the International Competition of Ilzach in France and of the prestigious Michelangelo Prize. The Quartet has recorded for Nuova Era and an album dedicated to Robert Schumann with the fortepiano for the Chandos label. Ms. Matteucci has performed in all the major cities and festivals in Italy, and has toured throughout Europe, South America, and the Republic of China. She recently collaborated with Amanda Sandrelli in the theatrical performance Voce e note di donne (Voices and Notes of Women). She has held master classes in Brazil and Argentina and recently started a series of master classes and concerts in Maynooth, National University of Ireland, as well as in Lithuania. 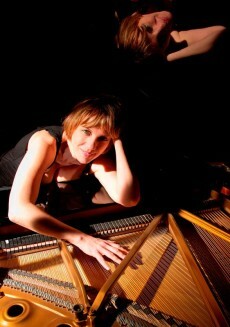 She holds the chair in piano, experimental biennial piano, and experimental biennial chamber music at the A. Casella Conservatory in L’Aquila, Italy.